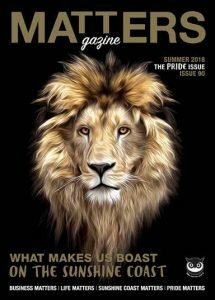 The Sunshine Coast’s leading business and life magazine. 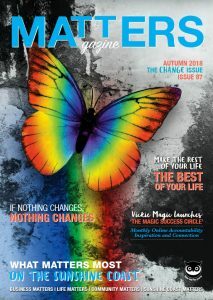 Matters Magazine is passionate about making a difference to business and Life, we aim to inform, educate, motivate and connect business to business. People buy from people they know, like and trust, become known through advertising in the magazine, advertising starts from as little as $250 + gst. 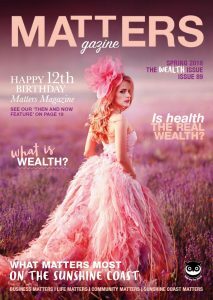 Matters Magazine is the Sunshine Coast’s leading business to business (B2B) magazine. Grow your company and achieve business success! There is no better way to target Sunshine Coast business owners with your products, services or events for both Business and Life. 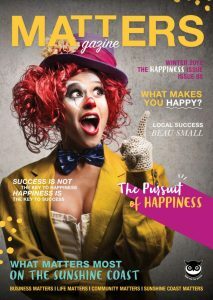 There are several options available to Sunshine Coast businesses looking to promote their products and services via our business magazine, including online advertising, placement in our regular emarketing broadcasts to our database of over 5,500 and of course advertising in our printed magazine which is distributed to 15,000 Sunshine Coast business people. Online display advertising is FREE TO advertisers. Our team here at Business Matters Magazine would love to help you grow your business and can create a customised advertising package to suit your target market and your budget. Read below for more information on each of the advertising options. Powerfully combining a successful printed magazine, distributed to key decision-makers from Beerwah to Pomonaa, with this 24/7 web portal Matters Magazine has gone from strength to strength. For just $150.00 per year you can receive a one year subscription of Matters Magazine direct to you (Australia Only). Plus receive a monthly newsletter, be part of our online directory and much more, get a free button ad on the website, plus receive four tickets to attend four of our launches. To find out more about advertising in the magazine, please contact our sales team here or call 0433 198 868 for more information, alternatively you can download our current media kit.